These services are used by either external Lync clients or for federation purposes (i.e. Lync connectivity with other Lync organizations). Note. 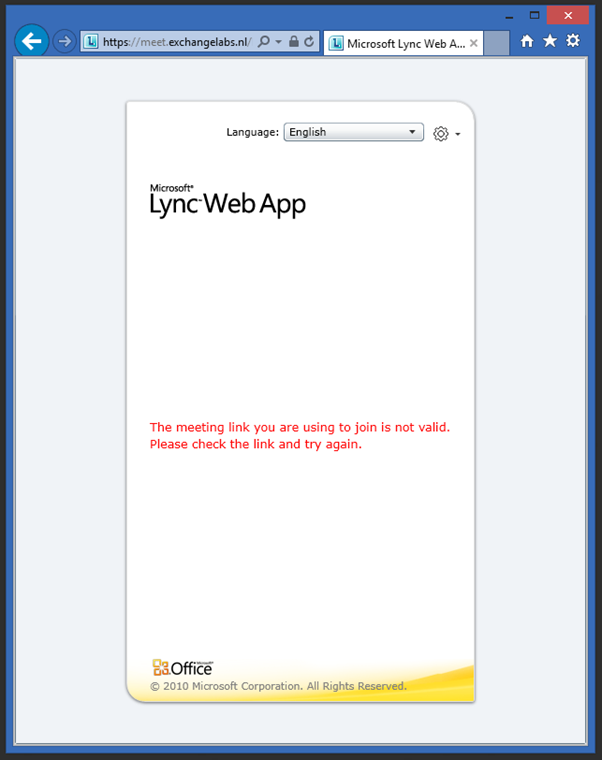 The internal name of the Lync Front-End pool is lyncpool.exchangelabs.nl but the external name is lyncweb.exchangelabs.nl. This can be configured using the Topology Builder. A reverse proxy is meant to be installed in the perimeter network and as such it cannot be a member of the internal Active Directory domain. The server needs an FQDN as well, so besides a normal server name you have to enter the DNS suffix. In my lab environment this will be ARR01.exchangelabs.nl. I have been using Windows Server 2012 R2 with 2 NICs of course. Make sure you’ve the the name resolution working correctly otherwise you’ll be presented all kinds of funky error messages. ARR is installed using the web platform installer, so click the link, click Run (or Save if you want to store on disk first) and follow the wizard. 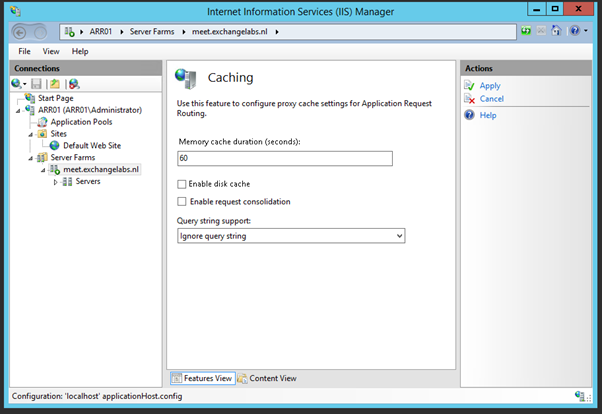 As you can see in the screenshot the IIS prerequisite software is automatically installed. Since the web services are using HTTPS you have to use an SSL certificate on the ARR server. I’ve seen deployments where one certificate was used both on the Lync Edge Server and the Reverse Proxy server, but a dedicated SSL UC certificate is possible as well. Personally I’m using Digicert certificates for this. Make sure you use an SSL certificate with the proper FQDNs (meet.<yourdomain>, dialin.<yourdomain> and lyncweb.<yourdomain>) in the Subject Alternative Names field of the certificate. 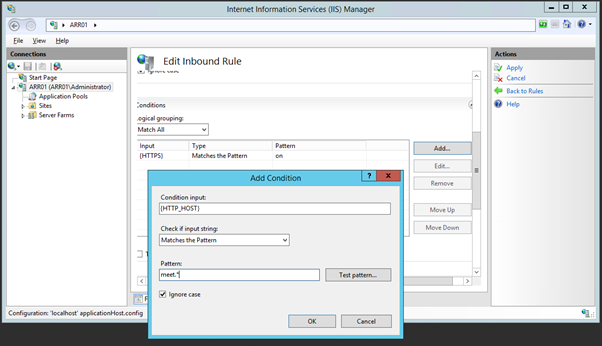 When the SSL certificate is imported you have to bind it to the webserver in IIS Manager. 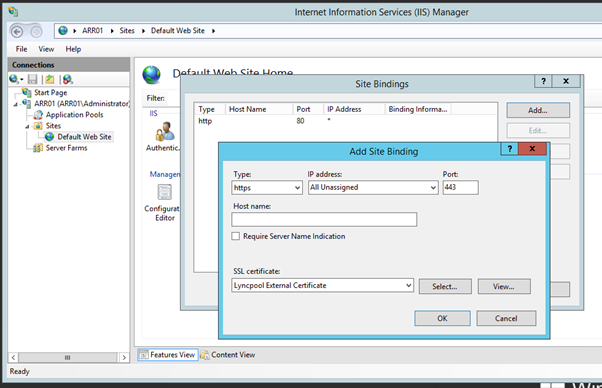 Open IIS Manager, select the Default Web Site and click Bindings in the Action Pane. In the Site Bindings window click Add, select https in the Type dropdown box and select the SSL certificate we just imported in the SSL Certificate dropdown box. Click OK and click Close to finish the wizard. The server is now fully installed and ready to configure ARR. 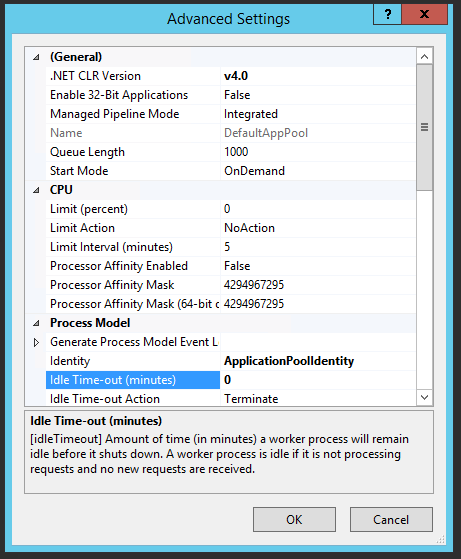 To make sure the Worker process for the Default Web Site always runs you can disable the Idle Time-Out feature for the main website application pools. To do this, open IIS Manager, expand the server ARR01, click on Application Pools and select the DefaultAppPool in the results pane. In the Actions Pane click Advanced Settings. In the Advanced Settings window change the Idle Time-Out feature to 0 (minutes) to disable this feature. Click OK to save the new setting and close the Advance Settings window. To create the Server Farms for each of the simple URL follow these steps. We’ll start with the meet.exchangelabs.nl simple URL, but you have to repeat these for the dial.exchangelabs.nl and the lyncweb.exchangelabs.nl Simple URL. 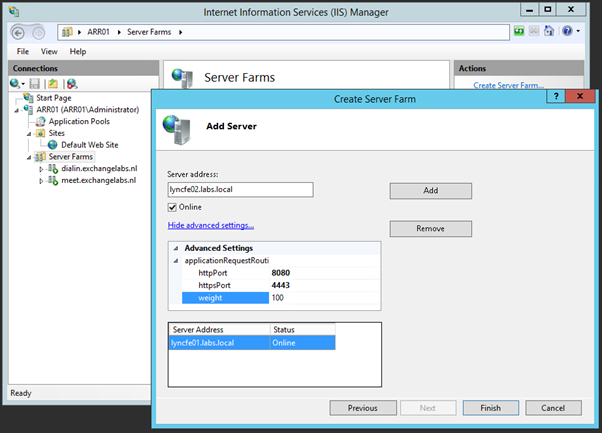 In IIS Manager right click on Server Farms and select Create Server Farm. In the Create Server Farm window enter the name of the new Server Farm (i.e. meet.exchangelabs.nl) and click Next. 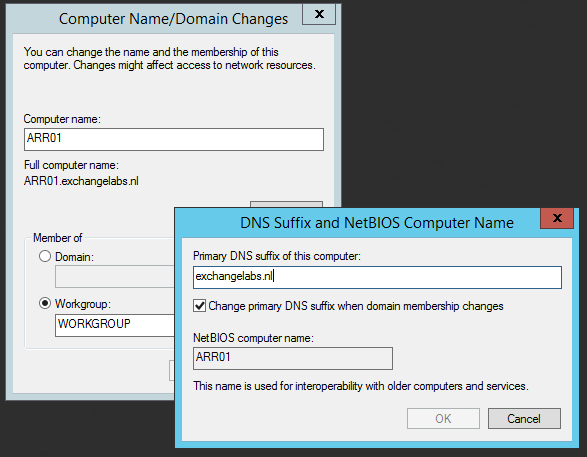 Enter the Server address of the internal Simple URL (I’m using split DNS so this is again meet.exchangelabs.nl, make sure it resolved to the internal IP address and NOT the external IP address of the ARR server!!) and click on Advanced settings…. In the applicationRequestRouting field change the httpPort to 8080 and the httpsPort to 4443. Click Add to add the server to the server farm and click Finish to close the Create Server Farm wizard. A Rewrite Rule pop-up window is shown, asking to rewrite all incoming requests to this server farm automatically. Click Yes to confirm. 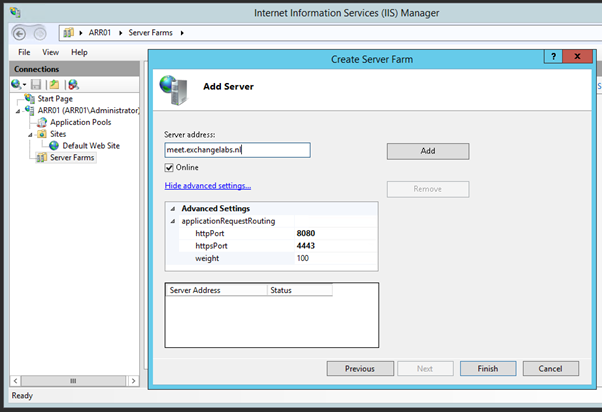 To configure the new Server Farm select it in IIS Manager under Server Farms. In the details pane double click on Caching. Uncheck the Enable disk cache option and click Apply. Select the meet.exchangelabs.nl server farm again and double click on Proxy. Change the Time-out value from 30 seconds to 200 seconds and click Apply. Select the meet.exchangelabs.nl server farm again and double click on Routing Rules. Uncheck the Enable SSL offloading option to disable SSL offloading and click Apply. Repeat these steps for the dial.exchangelabs.nl Simple URL. Repeat these steps for the lyncweb.exchangelabs.nl Simple URL, but in the Server Address field use the internal FQDN of the Lync Front-End server (for example LyncFE01.labs.local). 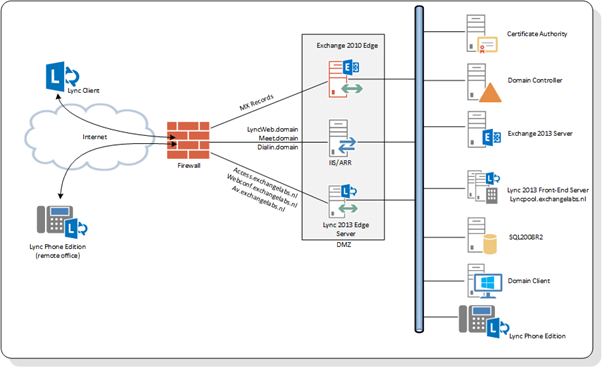 If you have multiple Lync Front-End servers just add them to the lyncweb server farm. This is shown in the following figure. When you’ve configured the Server Farms the last step you have to do is to configure the URL Rewrite Rules. In IIS Manager Select the server root node (like ARR01 (ARR01\Administrator) in this example) and in the details pane double click on URL Rewrite. A list of 6 URL Rewrite rules should appear. Every server farm that was created in the previous step has two rules, one HTTP and one HTTPS. Since we will only be using HTTPS you can safely delete all the HTTP rules. Click OK to add this condition to the list. Click Apply to save these settings. 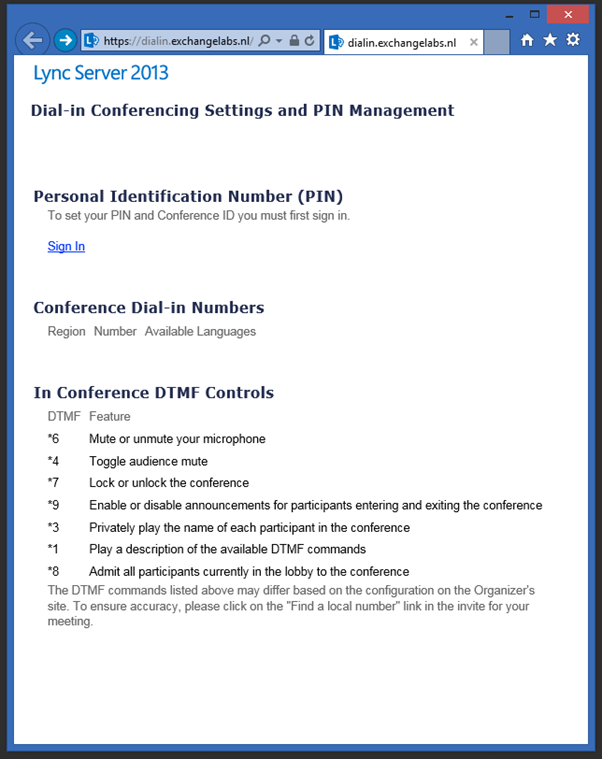 Repeat these steps for the dialin rule and the lyncweb rule. To test the reverse proxy make sure the IP address for the three services (meet, dialin and lyncweb) are set in DNS and can be fully resolved (and there’s not firewall blocking stuff of course). 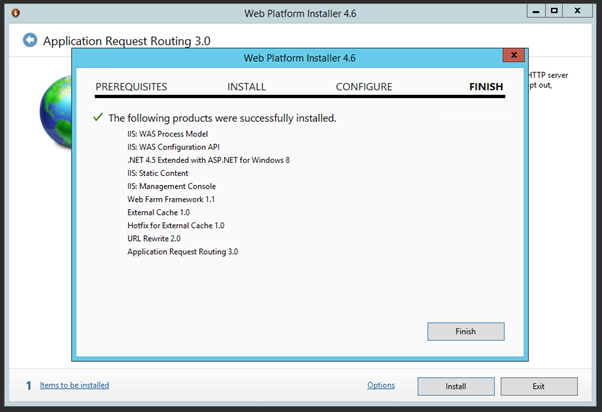 IIS/ARR is another Microsoft solution for reverse proxying your Lync environment. It’s easy to use and fully supported (of course). An interesting solution if you don’t want to use a load balancer for this. Thank you Jaap! This worked really well for me. But should’nt the autodiscover.domain.tld also be routed through the ARR? Hi! Congrats on the article, very good! How can we build a high available reverse proxy? This “one reverse proxy scenario” has no high availability. Same reverse proxy with same wildcard certificate will be challenging, I assume you also want to use a single IP address? If you want to add HA to this solution you have to add a load balancing. I have had it working with a hardware load balancer, but I assume NLB should be possible as well. Please confirm the meet.domain.com and other simple urls should resolve to the Internal NIC of the ARR server not the Lync Front End server? No, internal clients connect directly to the Lync Front-End server and NOT to the internal NIC of the ARR server. The online remote connectivity analyzer completes successfully, I can view the web ticket. The only test that fails is the Lync connectivity analyzer with the following errors. All my mobile clients cannot function. DNS resolves this FQDN successfully and it listens on port 80 so you’re fine here. I have no idea why it wants to resolve the internal servername, this should be something in the Lync Topology, so maybe you can have a look here. The ‘HTTP status code NotAcceptable’ however looks like an issue with an invalid translation in IIS/ARR, so you have to check this as well. Thanks will do, awesome posts. what if the topology is on 2 internal networks (192.168.x.x / 192.168.10.x ) where do I get UC cert from? I guess it doesnt have to be public cert auth. Can I just generate it on my internal cert auth? 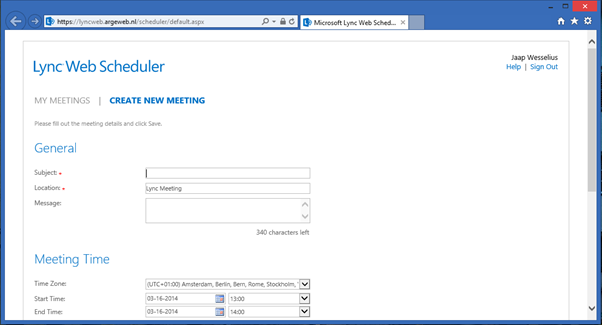 why would you use LyncFE01.labs.local when your FE servers and simple URLs are on exchangelabs.nl domain? what a great post.. what if you want to publish office web app through RP and also what is the procedure in using the same certificate as that of edge to save cost and does it have any security downfall? No idea, never tried. I can imagine that you need to add an additional name on the certificate, but I’m not sure if the Office Web Apps server is supported with a UC certificate. But a single name SSL certificate is only a matter of a few dollars, so….